Detail When Jim Gabbert and Mike Lincoln sold their TV station KOFY-20 to New York based Granite Broadcasting Corporation, it was only a matter of time before the TV-20 Dogs were shown the door. 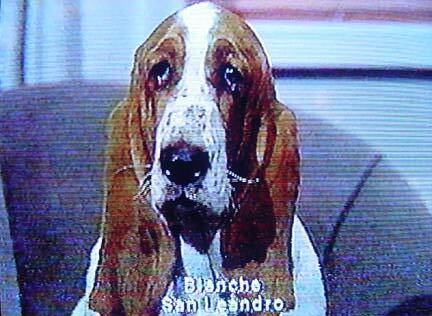 Over the years, thousands of dogs like Blanche of San Leandro were introduced to Bay Area viewers as stars of the ten second station identification clips shown before programs. A dog would appear in close up, then shown sitting in a chair next to a television set tuned to channel 20. As a jingle played, the pooch would turn on cue to face the set. What amused viewers most and earned the dogs a place in our popular culture was the droll manner in which they usually turned to face the direction of the TV set while their unseen and unheard masters signaled off camera. Some of the dogs were perkier than others but none was without charm. KOFY 20 was also the last place to see late night Streets of San Francisco reruns. Gabbert and Lincoln sold the station to Granite in the summer of 1998. By mid September, the dogs were gone. To take over KOFY, Granite shelled out upwards of $150 million to Gabbert and Lincoln, who donated $70 million from the sale to the Trust for Public Land. KOFY now broadcasts under the call letters KBWB as part of the WB network.